This week I will try to explain how to make motif lace with a hairpin frame. 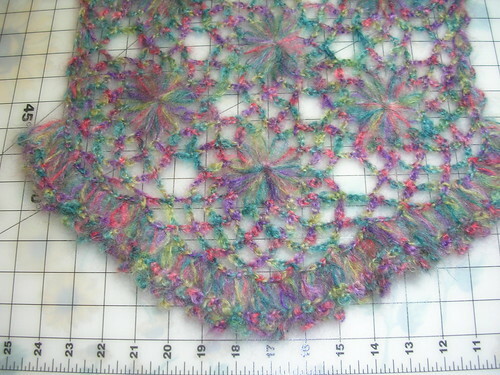 The actual doing is really easy since it is only single crochets and chains. Understanding the twists and turns is much more difficult. I still have a little of the yarn used in this stole left, so starting tomorrow I will photograph some of the steps to try and explain how to make the flower motif and then how to go from one flower to the next without cutting the yarn. Also I would like to show how to do the double ruffle, that is what makes this type of hairpin work so much fun. This entry was posted on Tuesday, December 16th, 2008 at 3:00 am and is filed under Crochet. Tagged: Crochet, Hairpin lace, Lace. You can feed this entry. You can leave a response, or trackback from your own site.